Home › Home and Kitchen › Big Stainless Steel Bag Clips For Air Tight Seal Grip On Coffee Bags Kitchen ..
Big Stainless Steel Bag Clips For Air Tight Seal Grip On Coffee Bags Kitchen ..
Use Anywhere - These stainless steel bag clips can be used anywhere. It doesn't matter if it's inside or outside, they'll get the job done. Their stainless steel construction ensures that they're tough enough to weather outdoor environments. It also prevents them from rusting if they get wet. These bag clips are definitely much more than chip clips. Use them in the garage, shed, or barn for storage. Throw your nuts and bolts in a bag and hang it with a clip from a wire. The clip has the strength to keep even the heaviest bags closed. But the versatility of these clips doesn't stop there. You can combine them with magnets, sticky pads, and other adhesive materials for even more great uses. For instance, you can use a magnet on one side of the click to create a simple refrigerator magnet. You can then use this as a place to keep to-do lists, important phone numbers, and quick notes to your family. You can even attach adhesive materials to one side of the clip. This allows you to use them much like a refrigerator magnet clip on surfaces that aren't magnetic. Use your stainless steel clip in the office to keep notes handy. The adhesive is easy to clean off of the clip thanks, once again, to its stainless steel design. Great Looking - The thing about stainless steel is that it looks good in just about every kitchen. It doesn't matter what your particular theme or decor is like, these bag clips will fit in. Their stainless steel finish is nothing short of beautiful. Of course, these bag clips look their absolute best in a stainless steel kitchen, complete with stainless steel appliances. However, they'll look almost as good with kitchens that are primarily composed of wood, granite, or other materials. Another aspect that correlates to this stainless steel bag clip's great looks is its simple and straightforward design. There is nothing gaudy or fancy about it. There is no brand name printed in big letters on the clip. It's all about pure and simple beauty. These are the bag clips preferred by chefs and other professional cooks around the world. Durable - The facts are in. 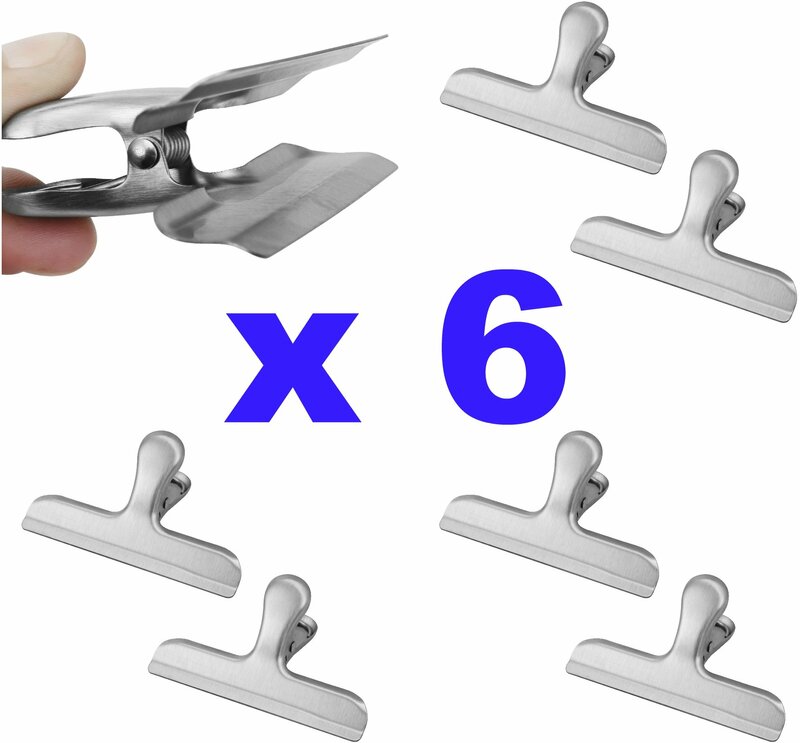 These big stainless steel bag clips are incredibly durable. They'll stand up to all the abuse you can throw at them. Even when used outside in harsh environments, they'll stand up to a lot of wear and tear. Their durability also translates into increased savings. Unlike plastic bag clips, you won't have to continue to replace these. They can be used for years on end with very little wear and tear. This makes them a great investment no matter how you look at it. The durability also means you can trust these clips. When used in commercial settings or outdoors, you need a clamp you can count on. You can count on these stainless steel bag clips to perform better than your highest expectations at all times. You will never doubt their reliability. Opens Wide - What's the point of a bag clip that doesn't open wide enough for the bags you wan to clip? There's no point. And that's exactly why these stainless steel bag clips open up so wide. In fact, the jaws on this bag clip open wider than most other bag clips on the market. You can open them as wide as you need to for whatever type of bag you're clipping closed. In addition to the convenience of opening wider, the wide mouth also ensures these clips don't break. You won't bend them too far back and break them when trying to open them wide. This kitchen organization clamp design provides a simple, convenient, and easy way to close and reseal opened bags. Your food stays fresh for weeks, even months. The ergonomic shape provides a comfortable gripping surface. Use it for your potato chips, cereal, cookies, flour, sugar, frozen food, coffee, trail mix, or anything else you need to keep fresh. This 6 piece clip set provides heavy duty holding power while eliminating the need for troublesome twist-ties, bread tags or weak plastic clips. An excellent way to remain organized in the kitchen, office, garage, shop, yard, camping, events, parties, boats, cars and more! For any bag without its own re-sealable ziplock! Have you ever opened a bag of food or snack and didn't finish its contents, and wondered how you'll store it without spilling it everywhere? These spring clips are one of the most useful kitchen gadgets ever created. Large size fits nearly every large bag in your pantry or backpack and extra wide, non-slip openings grip items securely for sealing large-size or bulk-size bags. Designed to re-seal virtually any poly plastic bag or paper pouch. Bag clip is perfect to close and secure coffee bags. Your coffee will stay fresh longer. This heavy duty steel clip can also be used for clipping books or magazines open for hands-free reading. Modern design of a quality stainless steel kitchen utensil they are nearly unbreakable and your satisfaction is guaranteed. They are the last clip you will ever buy. Purchase one for yourself and one for a companion or relative! These make interesting gifts for any birthday, wedding, Mothers Day or for your organizations special events.